Work vests that keep you warm. Made tough as any work vest is made, with features that let you move with ease while you work. 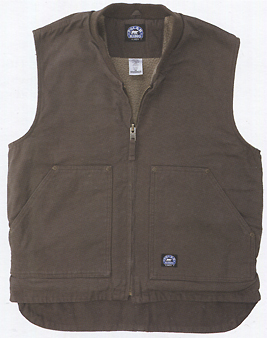 Reinforced everything, and a lining that makes this Ranch work vest a great choice for most of the year. Wear it more open, to keep the chill off your back, or close it up for those colder days. 100% cotton heavyweight duck. Berber lining. Pewter hardware. Front Zipper with pull tab. Rivet reinforcement at stress points. Side entry pocket on chest. Two interior pockets with Velcro closures. Elastic take-ups in back. Triple needle stitching. Locker loop. Brushed Hand washed finish.